Christian Borle accepts the Tony for Best Performance by a Featured Actor in a Musical for "Something Rotten!" 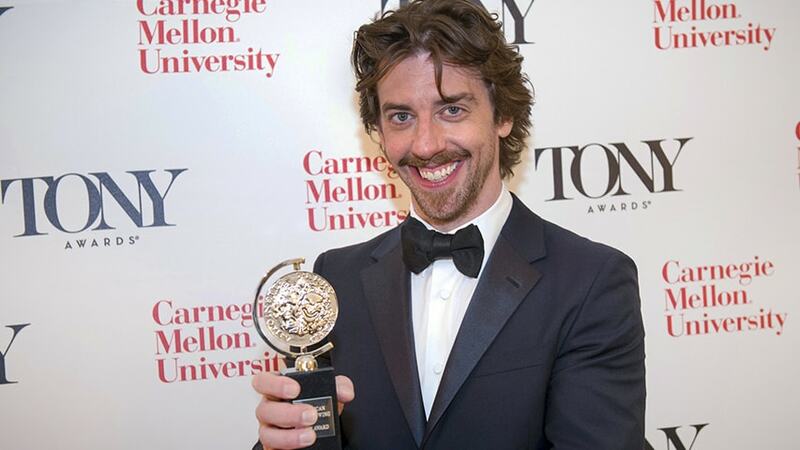 Carnegie Mellon University alumnus Christian Borle (A’95) received a Tony Award on Sunday night at Radio City Music Hall, increasing the number of Tonys received by Carnegie Mellon alumni to 41. During the broadcast on CBS, Carnegie Mellon and the Tony Awards announced Corey Mitchell, theater arts teacher at the Northwest School of the Arts in Charlotte, N.C., as the winner of the inaugural Excellence in Theatre Education Award. He was recognized during the show by another CMU alumnus, Joe Manganiello (A’04), who introduced Mitchell from the audience. The award is the first, national recognition program to honor kindergarten through high-school (K-12) theatre educators who demonstrate a monumental impact on the lives of students and who embody the highest standards of the profession. More than 4,000 nominations were received from across the United States for the award. Reared in rural North Carolina and educated at the University of North Carolina at Wilmington, Mitchell is now completing 20 years in the classroom and his 14th year at Northwest School of the Arts in Charlotte. He teaches acting and leads a dynamic musical theatre program. Mitchell does not shy away from material that challenges his students, the audience or his own skills. Some of the most notable of his 70-plus productions include “For Colored Girls,” “Pippin,” “Edges,” “Aida,” “Rent” and “Hair.” During his career, Mitchell has garnered recognition as a director, performer and teacher. He was named the North Carolina Outstanding Theatre Arts Educator in 2007. The Tony Awards also recognized CMU alumnus Stephen Schwartz (A’68), who was named this year’s recipient for the Isabelle Stevenson Tony Award. Schwartz is best known for his music and lyrics for such shows as Godspell, Pippin and Wicked. The Isabelle Stevenson Tony Award is presented annually to a member of the theatre community who has made a substantial contribution of volunteered time and effort on behalf of one or more humanitarian, social service or charitable organizations. CMU’s School of Drama is the oldest drama degree-granting program in the United States. Recognized as an international leader in the arts and technology, CMU’s drama school consistently ranks as one of the world’s best and has produced hundreds of Tony nominees.